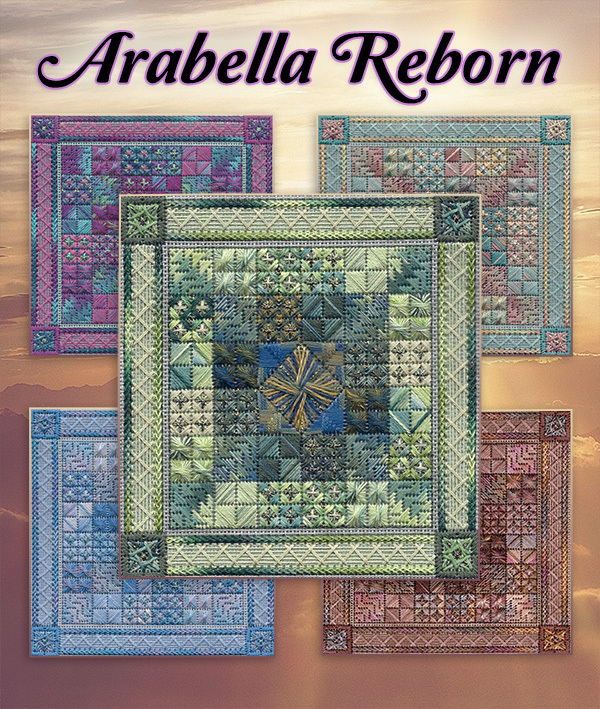 Arabella Reborn is an intermediate level counted canvas design. It is a quilt-inspired stitch sampler. The finished design size is approximately 5 1/2 inches square. The working canvas is 12 inches square. The design is worked on 18-mono canvas. It features threads from the Caron Collection: Watercolours, Wildflowers, Waterlilies, Impressions, and Soie Cristale; and, Kreinik Braids. Stitches used in the design include: Sprats Head, Double Fan Doubled, Milanese, Rice stitch variations, Scotch square variations, Rhodes stitches, backstitch, slanted gobelin, Eight Point Star, plaited stitch, and herringbone couching. This design uses creative thread blending in the needle to create a third color value from light and dark values of solid and hand-dyed threads. There are a total of 6 colorway options included.